Anyways, I had to read our upcoming book early this month, so that I could give the copy to one of the kids instead of keeping a copy for myself. That book is Shiloh, by Phyllis Reynolds Naylor. Okay, the fact that I had never read this book before is just…pathetic. My 16th birthday present was a beagle, who still lives with my parents now (because although she is “mine” there is no way she’d ever leave my dad!). I love beagles! So to think I’d never read this? Craziness. 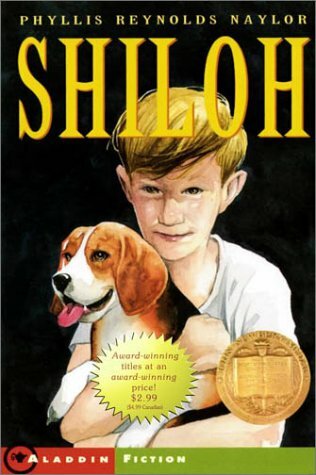 Shiloh is about eleven-year-old Marty, a boy who one day finds a young beagle following him. Turns out, the beagle is being abused by a mean neighbour, and Marty soon begins to hide Shiloh away to keep him safe. This is a great story. It’s not very long, but it deals with interesting ideas; mostly, the difference between right and wrong, and how tricky that distinction can be. There was no moralizing or anything in this book, but it was heartwarming and cute, with some definite teary-eyed bits thrown in. To me, it read like a slightly younger (and happier) version of Where the Red Fern Grows. It’s a great read for kids who love dogs, and I think my book club kids are definitely going to enjoy it.